The Twins got the not-so-good Fernando Rodney Experience on Thursday. The Twins closer hit one batter and walked two, the second with the bases loaded, to blow a save opp. The Twins eventually prevailed in 13 innings anyway, but Rodney's loss of command stressed his bullpen mates and leaves the relief corps wearied going forward. That said, Rodney has been impressively good since April's chronic uncertainty. His ERA remains below 3, which didn't seem possible two months ago (his ERA entering May was 5.87). It is a major oversimplification to depict the Twins' offseason closer decision as a binary one of Rodney or Brandon Kintzler; there was a wide range of options available to the Minnesota front office, some more practical than others. Kintzler took a slightly richer deal to be a setup man with Washington than the 41-year-old Rodney accepted with the Twins. At the time, I thought, and wrote, that the Twins would have been better off bringing back Kintzler. As June nears its conclusion, it appears that I was wrong. Kintzler's walk rate has almost doubled this year. Rodney, who carries a merited reputation for lack of command, actually has a superior BB/9 rate this season. Kintzler's ERA is pushing 4.50. To be fair, Kintzler's FIP -- fielding independent pitching -- suggests that he is actually pitching almost exactly as well this year as last. FIP says he didn't fully merit his 3.03 cumulative ERA in 2017 and is doing better than his 4.45 this season. But Rodney is getting better results than Kintzler. I didn't see that coming. It was impossible to imagine Ron Gardenhire managing the Twins without Rick Anderson as his pitching coach. The duo, old buddies during their playing days with the mid-80s Mets, supposedly made a pact back then -- if and when Gardy got a big league managing job, Andy would be his pitching coach. And so it was, for 13 seasons, many good and some not. Which made it noteworthy that, when Gardenhire landed the dugout job in Detroit, it was with a different pitching coach. The Tigers has already hired Chris Bosio, discharged by the Chicago Cubs when Jim Hickey became available. Gardenhire did get to bring Anderson on as his bullpen coach, but Bosio was imposed on him by the higher ups. The nature of Bosio’s comments — and who they were directed toward — were not disclosed by (general manager Al) Avila. It is not clear whether those comments were racial, sexual or otherwise bigoted in nature. Gardy, in the above linked piece, speaks highly of Bosio as a pitching coach but added: “This organization has to act and they did." And so Gardenhire has Anderson as his pitching coach once again. Since the Rays shut out the Nationals on Tuesday, the larger point still stands. This is a team running with two traditional starters, and almost five weeks into it, with a bunch of games against good lineups, it's working. I caught the end of the Rays' 1-0 win Tuesday, which featured some really out-of-the-box managerial strategy from Kevin Cash. Top of the ninth, the Nats have up Bryce Harper (lefty), followed by Anthony Rendon (righty), Juan Soto (lefty) and Daniel Murphy (lefty). Four high quality hitters. Cash brings in Jose Alvarado, his top lefty reliever. Alvarado promptly walks Harper, who showed bunt on practically every pitch. Now ... Cash doesn't want Alvarado pitching to Rendon with the tying run on, but he wants him to face Soto and Murphy. What to do? His answer: He pulled right fielder Johnny Fields; moved Mallex Smith from left to right, shifted first baseman Jake Bauers to left field and had Alvarado play first base (with Bauers' glove), with Chaz Roe coming in to pitch. (As a sidelight to all this, the Rays lose the DH). Alvarado was laughing as he took his new position. This kind of thing -- moving the pitcher to a defensive position for a batter -- isn't unprecedented. Paul Richards did it a few times in the 1950s, and Whitey Herzog did it in the 1980s. But they generally were putting the transplant someplace where they didn't expect the ball to go. First base may carry the lightest physical demands, but the first baseman is quite likely to touch the ball. So the Nats announcers are speculating on whether Roe dares try a pickoff throw and if Rendon should bunt toward first and force Alvarado to make a play. There are a lot of ways for the Nationals to try to take advantage of this novice playing first base. And they did none of them. Harper doesn't take a monster lead and steal second; Rendon doesn't bunt toward first. Rendon strikes out. And Cash undoes all his earlier moves. Bauers reclaims his glove and returns to first, Smith goes back to left, Carlos Gomez comes in to play right, and Alvarado returns to the mound (and gets his warmup pitches). The Rays have lost their DH for the remainder of the game, but they have their favored lefty to face Soto and Murphy, so they're where they want to be. Soto singles to center, Harper stops at second. Murphy singles to left; Harper stops at third. All this maneuvering to get Alvarado to face the lefties, and he retires none of 'em. Now the Nats have right-handed hitters up, Trea Turner and Michael A. Taylor. Cash brings in Sergio Romo, who throws a few sliders and pops up Turner and fans Taylor, end of game. And all the postgame attention went not to Cash's brainstorm but to the postgame yelling by Romo at Taylor, who apparently drew Romo's ire in a previous game by stealing a base. Eyeroll. That, in my mind, is just stupid jock stuff. It's nowhere near as interesting as a pitcher playing first for a batter. Per Berardino, the Twins expect to see four straight right-handed starters, so Cave figures to provide another lefty bat. Come the weekend, however, they'll see a string of left-handed starters. That might be the opening for Buxton's return. It can't the just-demoted Ryan LaMarre, unless somebody else goes on the disabled list. Which, the way this season has gone for the Twins, is quite possible. The Twins won Sunday 2-0. They also lost two of three to the last-place team in the AL West and sit eight games behind Cleveland in the standings. Reinforcments, at least internal, are probably on the way. The Twins optioned out Ryan LaMarre after Sunday's game; my expectation is that Byron Buxton will rejoin the team in Chicago tomorrow. Between injuries and slumps, the Twins haven't gotten anything out of Buxton yet this season. He was, by Baseball Reference's version of WAR, the best player on the 2017 Twins. The gap between the 2017 Buck and the 2018 Buck is a significant portion of the difference between the 2017 Twins and the 2018 Twins. And next week Jorge Polanco returns from his PED suspension. I'm not sure that's going to improve the infield defense, but Polanco is a better hitter than Ehire Adrianza, and this lineup can use a dose of his relatively high bat-on-ball skills. One obvious conclusion to be drawn from a glance at the AL standings is that the "pennant races" in the junior circuit are merely about playoff positioning. The Yankees and Red Sox have a double-digit lead over everybody else in their division; Cleveland, as noted, is eight games up in the Central; and the Astros and Mariners are putting space between themselves and the Angels. Jessica Mendoza of ESPN's Sunday Night Baseball crew tried during a rain delay to make a case for the Twins getting back into the picture. While I appreciate the effort, I'm not buying it. It's possible for the Twins to run off a winning streak. But I suspect the story around this team for the next five weeks or so is going to be who gets sold off. RIP to Donald Hall, former U.S. poet laureate. I don't consume much poetry, but Hall was a marvel when he turned his wordsmithing into the direction of baseball. I can recommend to you his "Dock Ellis in the Country of Baseball." I can't lend you my copy; I lent it years ago to a colleague who promptly dropped it while taking a bath. are in agreement on the call on his double Tuesday. 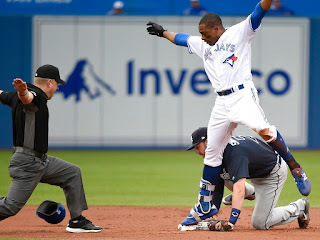 Curtis Granderson, known in these parts as the greatest of the Mankao Mashers, is having a decent bounceback season with the Toronto Blue Jays. He's become a platoon player at age 37 -- just 20 plate appearances against lefties coming into Friday's play -- and having his at-bats focused on right-handing pitching has resulted in a sharply improved on-base percentage. This is the Grandy Man's 15th major league season and his fifth team. I was, frankly, a bit surprised he got an offer during the winter. He's lived up to it, probably in part because he's not getting overexposed. The portion of Friday's post that regarded Matt Belisle emphatically stands. He didn't cost the Twins Friday's game, but he certainly made sure they were out of it. I can't see how he makes it through the month, mentor or no. It would be inaccurate to blame the Twins loss Thursday on the bullpen. The lineup contributed zero runs to the cause until the ninth inning against one of Boston's lower leverage pitchers. 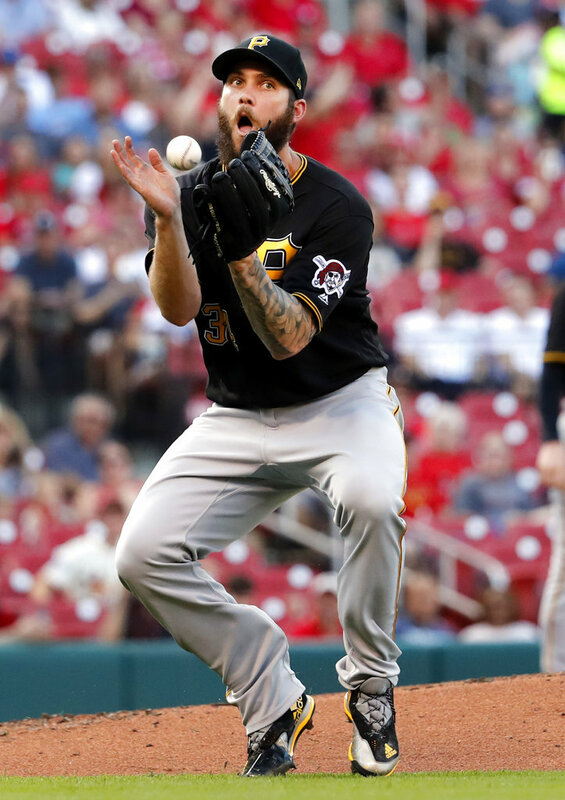 But the bullpen -- specifically Ryan Pressly and Matt Belisle -- did turn a close game into a rout, and there were big-picture choices involved that made that outcome more likely than not. Choice One: The heavy use of Pressly. Thursday was the 71st game the Twins have played this year. It was the 37th appearance for Pressly, who has now appeared in 52.1 percent of the Twins games. At that usage rate, he would pitch in 84 games. This would not be a record -- 1970s relief legend Mike Marshall pitched had three seasons, with three different clubs, of at least 90 appearances (the last being the Twins in 1979). But using Pressly at the frequency of Iron Mike is beginning to backfire. He has surrendered multiple runs in four of his last six outings, and his ERA, which entered the month at 2.22, is now at 4.15. Of course, somebody has to pitch. And the Twins have four other relievers (Zach Duke, Trevor Hildenberger, Addison Reed and Taylor Rodgers) with at least 30 appearances apiece, and Hildenberger, has pitched more innings than Pressly. Which brings us to the second choice. Choice Two: The presence of Matt Belisle on the roster. The Twins have eight relievers on their roster -- the above mentioned five hard-worked middle/setup men, closer Fernando Rodney, Matt Magill and Belisle. Magill has pitched well (1.46 ERA after Thursday's mopup inning), but Paul Molitor seems reluctant to use him in game situations. And Belisle -- well, we saw him quite a bit last season, and what we saw then remains true now. He's not a guy you can use with frequency, and he's prone to outings that just get away from him. One of them was Thursday: one inning, four hits, three runs. The Twins apparently love Belisle as a mentor, but the first job is getting outs. If the Twins are going to carry that extra reliever, it has to be somebody who can lighten the burden on guys like Pressly and Reed, who are showing signs of fatigue. That's not Belisle. Lance Lynn, facing one of the best teams in baseball, allowed just one (unearned) run Wednesday night. Lance Lynn threw 97 pitches, just over half for strikes, and walked five men while striking out two. He lasted just five innings. Good results, bad process. Which do you trust more? Lynn's ERA is now a season best 4.64, which ain't good but is 3.73 better than his ERA at the end of April. But even as he lowered his ERA through his nine starts in May and June, he walked 23 men in 50 innings. He's made it work, in large part because he's surrendered just two home runs in that stretch. But it isn't pretty. He gives me Mike Pelfrey flashbacks at times -- a big right-hander with one usable pitch of which he has imperfect command. Lynn does miss more bats than Pelfrey did, however. He didn't pile up a lot of strikeouts Wednesday against Boston, but in those most recent 50 innings he has 47 strikeouts. Pelfrey would have needed about 90 innings to get to 47. Bottom line: Lynn isn't really pitching that well. Every double helps, I guess. Really, that scoring ruling changed nothing except Escobar's doubles count. It went from a single and error on Jackie Bradley Jr to a double and error on JBJ, since Escobar wound up at third. It doesn't affect anybody's ERA, batting average or even fielding percentage. Escobar has played in 66 games so far this season and has had at least one double in 25 of them. His longest doubles streak is four (June 3-6, a span that includes an off day and, natch, a doubleheader). I'm about ready to embrace his chances of getting this record. Joe Mauer was hit twice with pitches on Tuesday. They were his first two HBPs of the season. His career high is three, which is higher than I expected. So I guess Mauer is now on pace for a career high in a statistical category. Mauer is at 25 career HBP. This does not put him in the top 100 of active players. In comparison, Mike Trout (tied for 37th among active players) has been hit 58 times, Miguel Cabrera 60 and Carlos Gomez -- who does get under some people's skin -- 96. The current career leader in HBP is Chase Utley with an even 200. That's a few bruises. Some of us have been anticipating the return of Trevor May to the major league club at some point this season as he returns from Tommy John surgery. Such a return seems farther away than I expected. May has had command issues -- which is fairly common at this point in the rehab process -- and is now on the disabled list at Triple A Rochester with shoulder inflammation. One aspect of the addition of Taylor Motter to the Twins organization -- and the retention of Gregorio Petit -- is that Taylor Featherston got pushed out. The Twins released the light-hitting infielder the other day. Featherston's had some major league time with three different clubs, and the Twins signed him as a minor league free agent over the winter and had him in training camp. But he didn't hit at all in Rochester, and with Nick Gordon now at Triple A and Petit back in Rochester, Featherston was redundant. The problem solved itself, and not in a good way for Javier, who developed shoulder issues early in camp and is now out for the season after surgery on his labrum. He's expected back in time for next spring training. Lewis has had some ups and downs in the Midwest League, including some knee discomfort, but he's expected to get promoted to high A Fort Myers soon. If, like me, you put off going to Cedar Rapids in the first half of the MWL season, you are likely to miss not only Lewis but Alex Kirilloff, the Twins 2016 first round pick. The outfielder, who missed all of 2017, is hitting .333/.391/.607 for the Kernels. The Twins on Sunday had an inning ended when both Ehire Adrianza and Mitch Garver got caught in rundowns. It is today a what-if play -- what it Joe Mauer had gotten to hit with men on the corners in that inning? Would it have changed the complexion of the game? We don't know that alternative universe. We do know that in this universe the 2018 Twins have seemingly been prone to baserunning blunders. *The Twins lead the American League in getting picked off, with 10. Nobody else has more than seven. * The Twins are next to last in stolen base attempts (23). Only Oakland tries to steal less often. * The Twins have the fifth worst stolen base percentage in the AL, at 72 percent. * The Twins have been thrown out on the bases 23 times, which is exactly league average. Boston and Houston are 1-3 in this, but they have lots more baserunners. Tampa Bay is second in lost runners. * The Twins are second in the AL in extra bases taken. They've gone first-to-third or second-to-home on singles, or first to home on doubles, on 48 percent of such opportunities; only Texas, at 50 percent, is higher. Specifically, the Twins have gone first to third on a single 38 times in 101 such opportunities; first to home on 23 of 51 doubles with a man on first; and second to home on 42 of 64 singles. All three in this photo were injured in the shooting last spring at the Republican team's practice session. 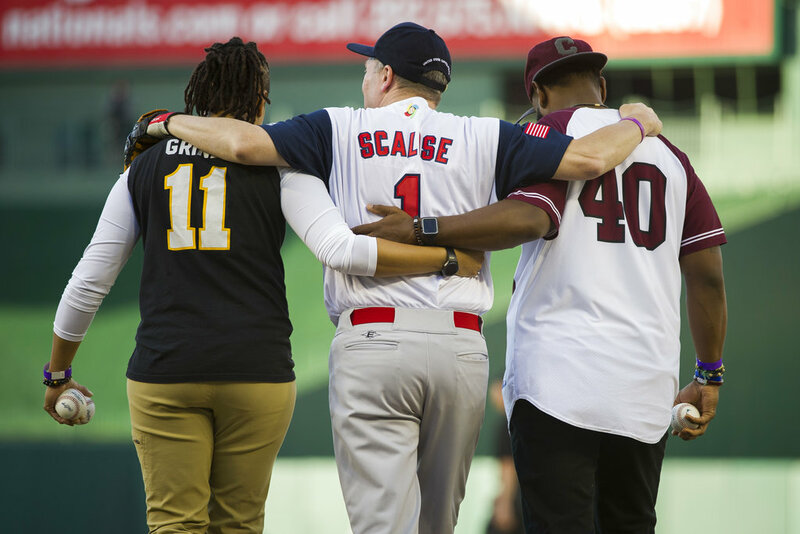 Scalise, whose position as majority whip makes him the No. 3 leader in the Republican caucus, has had multiple operations. He started the game for the GOP and made a play in the field before coming out after a few pitches. Which is excusable considering that he uses a cane to get around. It started, in a sense, when the Twins filled the 40-man roster spot created by waiving Phil Hughes by picking up fringe utility man Taylor Motter, who they then stashed at Triple A Rochester. To put him on the active roster, they waived infielder Gregorio Petit. At one point I seriously thought he might have moved ahead of Ehire Adrianza, the Worst Pinch-Runner in the World, but no. Petit cleared waivers and he was stashed at Rochester. Then came Thursday's Sano shakeup, and the return of Joe Mauer from the disabled list. Lost in the tumult over Sano was the simultaneous demotion of Jake Cave, who had been platooning in center with Ryan LaMarre, with a corresponding move made Friday. That move was bringing up Motter. It remains a 13-man pitching staff. Eleven months ago Miguel Sano was an All Star. Today's he's not only back in the minors but in A ball. Sending the slugger to Fort Myers rather than Triple-A Rochester tells us that this is more than a "break the slump" demotion. This is intended to be a reboot of the slugger's career. We may not see the big man back in Minnesota for months, perhaps even until 2019. I interpert that as Sano can't be a star if he's not in the lineup, and he can't stay in the lineup if he's 290 pounds. And the solution is not as simple as "DH him" or "move him to first." Dmitri Young years ago was a first-rate hitter who ate his way out of the league and into a health crisis. I have no clue as to Sano's off-field habits, but it seems likely that the Twins want to drastically rework his entire approach to his career. They want him to be great, and he's not on that trajectory today. "I'm not mad. I'm happy because I'm struggling. You know, this is an opportunity they gave me. I know they love me here and everything. … Everybody here trying to help me. It's a chance to go there and work, and I'll come back soon." Say this for Falvey and the Twins: This is not a half-measure. This is a drastic move that undercuts Sano's trade value. Falvine are committed to making Sano the best he can be. Now we'll see how committed Sano is to the same project. The story of this game is not Addison Reed giving up mostly ground ball hits, it’s the offense scoring two runs against a bad Detroit pitching staff. Yeah, well, I got nothing good to say about the Twins hitting other than the two Eds (Rosario and Escobar), but if you have to score six runs to win you're probably not winning a lot of games. The @Twins have signed free agent RHP Matt Belisle - he will join the team in Detroit (number 19). To make room on the roster they have DFA'd Gregorio Petit. I not only do not care for this signing, I actively despise it as a symptom of the fetishization of the "proven veteran." Follow along: Belisle signed with the Cleveland Indians during the offseason. He allowed six runs in 10.2 innings, at which point the Tribe DFA'd him and he cleared waivers. He accepted a demotion to Triple A, where he gave up five runs in another 10.2 innings, whereupon Cleveland released him. And the Twins promptly gave him a major-league contract. Meanwhile, Alan Busenitz has an ERA of 0.38 in Rochester. Zero-point-three-eight. John Curtiss has a 2.31. Luke Bard 2.65. Lefty Gabriel Moya, 1.85. Here's the thing: the Indians bullpen has been awful all season. They decided Belisle can't help them. The Twins bullpen has been getting overworked, and Belisle last year seldom was asked to pitch on back-to-back days. Paul Molitor and Co. may love Belisle as a clubhouse presence and as a mentor to young pitchers, but this is not a team with s surplus of novices. The job is to get outs. There are plenty of more likely candidates for that at Rochester. Kinda makes you wonder why the fixation with having Ehrie Adrianza pinch run for Robbie Grossman, doesn't it? It's understandable. Adrianza is a glove-first middle infielder; Grossman is a poor defensive corner outfielder. Most good middle infield gloves come attached to fast feet. Most poor defensive outfielders aren't very mobile. And it's even possible that if you had the two run a 40-yard dash that Adrianza would win. But there are few situations on a baseball field in which a player is asked to run 120 feet in a straight line. It's 90 feet from home to first, after which there's a 90-degree turn to navigate. And what these numbers tell us in that Grossman does the running baseball requires faster than Adrianza. And after watching Adrianza stumble twice rounding third base before getting thrown out at home, I believe it. The Twins announced Sunday that Joe Mauer, who last played May 18, will begin a rehab assignment today with their Triple A affiliate. If all goes well, they apparently envision a two-day stint: DH today, first base Tuesday, rejoin the team Wednesday in Detroit. That's the best-case scenario. When it comes to Mauer's health, best case is a rarity, and we'll see how things actually transpire. I view Mauer's return with some trepidation. Not so much about him in the lineup; I remain convinced that this is a better team with Joe Mauer than without. I fret, instead, about Mauer himself. He has had some severe brain injuries, and that this occurrence of symptoms appears to have come without an actual blow to the head strikes me as worrisome. Coming into the season, I was relatively confident that Mauer would play beyond 2018. I am less confident of that today. I want Joe Mauer and his thoroughly professional example in the Twins lineup. But more than that, I want Joe Mauer to have a good life beyond his playing career. I'm hardly a neurosurgeon, but it's difficult for me to see how playing helps that latter goal. after hitting his second walk-off homer of the homestand. Charlie "Clutch" Culberson. 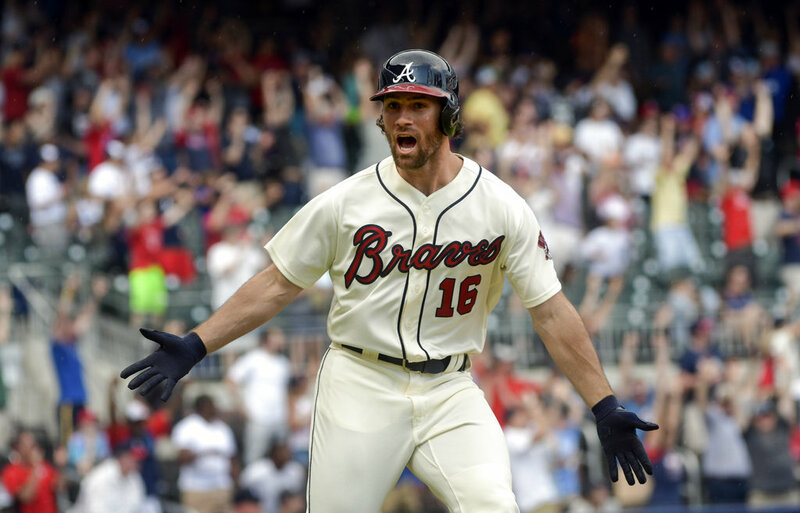 The utility infielder has eight home runs in his major league career, and half of them have been walk-offs. One came when he was playing for the Dodgers. It happened to be Vin Scully's final call as the Dodgers' broadcaster. This is the sixth season Culberson has been in the majors, but -- so far -- it's the first that he hasn't also spent time in the minors. He's not a star, not a regular, not truly an established major leaguer -- but he's had some spectacular moments. In my best glass-half-empty mode, I will note here that Ryan Pressly and Addison Reed have become disturbingly gopher-ball prone. ... Both have histories of allowing long balls, so it's not as if this is unexpected. And what happened Friday night? Pressly pitched the seventh, and gave up a two-run homer to turn a 2-1 lead into a 3-2 deficit. Reed pitched the eighth and gave up a solo shot. That we can see this coming just adds to the irritation when it happens. Trevor May, rehabbing from last spring's Tommy John surgery, apparently ran out of time on his rehab assignment. On Thursday the Twins essentially swapped him and Jason Castro's roster status -- Castro went on the 60-day DL and May came off -- and optioned May to Triple A. May's rehab is officially complete, but he's not ready for the majors yet. He appeared in six minor league games, four of them starts, on two levels during his rehab assignment, and struck out 20 hitters in 18 innings. He also walked 12, which tells us a lot about where he's at. Pedro Martinez is a hellva comp for any young pitcher, but last night, as MLB Network was showing highlights of Jose Berrios' complete game earlier in the day, the Hall of Famer said: He reminds me of me as a young pitcher. I can see that in a few ways -- short righties with a big fastball and imposing breaking stuff. What ultimately made Martinez great was his complete mastery of the changeup. Few power pitchers develop that pitch as well as Martinez did. It's no insult to Berrios to observe that his change isn't nearly as effective. I listened briefly to the Twins radio broadcast while walking the dog and turned it off during a Dan Gladden rant against analytics that booth visitor Tim Laudner was subtly encouraging. First Gladden complained that the Twins based some draft picks more heavily on analytics than on eyeball scouting. Then he said he'd like to see a team turn its baseball ops over to old school guys. Laudner agreed, at which point I turned it off. The old-school had its run. Its time as expired. We've seen what happens to old-school GMs in the era of analytics. Ruben Amaro Jr in Philadelphia. Tony LaRussa-Dave Stewart in Arizona. Terry Ryan in Minnesota. They get beat, and they get fired. Deliberate, defiant ignorance is a losing strategy. I doubt that when Gladden needs a physician he seeks one who figures that everything he needs to know was known in John McGraw's era, or even Branch Rickey's. The third and final day of the baseball draft deals in quantity, not quality. Picks 11 through 40 occasionally produce major league players, but rarely stars, and many high schoolers taken on the third day decline to sign and go to college. So in a very real sense, the biggest thing to happen Wednesday was something that didn't happen. Nobody took Luke Heimlich, Oregon State's ace lefty who pleaded guilty years ago to molesting his niece. Heimlich now denies what he admitted in court as a juvenile, and his record officially has been expunged. On talent alone, he was worthy of at least a second-round pick, perhaps higher, but no front office thought him worth the risk to their reputations. This, frankly, surprises me. We've seen this repeatedly in pro sports: The highest moral virtue is winning. I expected somebody to, at the very least, take him in the third day. And nobody did. Presumably no owner, no general manager, no scouting director wanted to take the risk. Heimlich is now too notorious to fly under the radar. No farm director could relish his inevitable quotes in the inevitable story in whatever town Heimlich was assigned to play in: "Admitted child molester to pitch here." And if that blowback is insufficiently intimidating, imagine the blowback if Heimlich got into trouble again. It's possible that Heimlich will get a free-agent offer from somebody. Perhaps he'll find an independent league team to pitch for. Or perhaps his baseball days end with this collegiate season -- the Beavers, with three first-round picks even excluding Heimlich, play Minnesota this week in a NCAA superregional for a berth in the College World Series. My personal hope is that his baseball days end with a loss to the Gophers. The Twins took, as noted in Tuesday's post, a pair of collegiate hitters with their first two picks in the amateur draft. Round 3-10 were held Tuesday, and the focus remained on hitters. The Twins forfeit their third-round pick to sign Lance Lynn, and they used their fourth-rounder to take a centerfielder from the University of Utah, DaShawn Keirsey. Keirsey hits and throws left-handed and is described as having a leadoff hitter profile. If the Twins can sign Charles Mack that's an outstanding pick in the 6th round. Mack is apparently a Clemson commit, and I'm guessing the Twins will have to go over slot ($254 K) to sign him. If so, that might explain the Jeffers pick in the second round. The Twins drafted just three pitchers on Day 2, and added a second catcher in Clemson senior Chris Williams. He too is likely to be a below-slot signing. The Twins are really stockpiling catching prospects these days. They drafted Ben Rortvelt in the second round in 2016 and traded for David Baneulos from Seattle during the offseason; those two are both at Cedar Rapids now. They got a catcher out of the Padres in the Phil Hughes deal as well; Janigson Villalobos hasn't been assigned to a roster yet. For a few minutes Monday evening, it seemed possible that one, or even two, consensus top-five talents in the baseball amateur draft would slip to the Twins' 20th pick. But a pair of teams with five first-day picks -- and a great deal of financial flexibility as a result -- interceded. Tampa Bay selected prep lefty Matthew Liberatore with the 16th pick and Kansas City claimed University of Florida ace Brady Singer with the 18th pick. The Jeffers pick was, at least to outsiders, a bit of a surprise. Baseball America barely had him in their top 300; MLB.com didn't have him in their top 200. He was, I believe, the one first-round pick for which MLB Network didn't have a highlights package premade. The Twins think he can develop as a defensive catcher, and really like his bat even if he can't catch in the majors. The Twins reportedly already have an agreement in principle with Larnach, whose team plays the University of Minnesota in a superregional this week. This is the second draft for the "Falvine" regime (and for scouting director Sean Johnson). It is also the second year in which their first two selections were position players (Royce Lewis and Brant Rooker last year). There is a principle gaining credence these days of "Draft bats, buy arms," the leading example of that being the Chicago Cubs. It's too soon to tell if that's what's going on here with the Twins, or if that's just the way these two first days fell. Well, that Cleveland series worked out pretty well for the Twins. They went from being at risk of being buried to pulling within 3.5 games of the Tribe by winning the last three games of the four-game set. Eddie Rosario ... well, what can one say? His three-homer game Sunday raised his slugging percentage 42 points, and I don't believe any of the homers came on pitches in the strike zone. The Twins have had some notable bad-ball hitters in my lifetime -- Kirby Puckett and Tony Oliva most prominent -- but I don't think I've seen anything like this. In my best glass-half-empty mode, I will note here that Ryan Pressly and Addison Reed have become disturbingly gopher-ball prone. Pressly in particular has been worked hard -- at his current rate of usage, he would set the American League record for games pitched, established by "Iron" Mike Marshall during his brief tenure with the Twins. Both have histories of allowing long balls, so it's not as if this is unexpected. The Twins have an off day on the field today, but it's the biggest day for the scouting department as the amateur draft begins. I haven't posted about the draft this year nearly as much as I usually do, in large part because the Twins pick 20th. That's pretty far down the list to get revved up about mock drafts. The idea seems to be, however, that this year's pool is heavy with college pitchers, and the mock drafts I've looked at suggest that's what the Twins are likely to take. Here we see a pitcher startled by the necessity of doing something other than throw a pitch. On April 26, Fernando Rodney entered with a lead. He did not get an out, and the Yankees beat the Twins. At that point Rodney had a 1-2 record with two saves, two blown saves and an ERA of 6.75. He had not had a 1-2-3 inning in 2018. He has allowed one run since. He has allowed just 10 baserunners in 11.1 innings -- five hits, five walks . His ERA on the season is 2.84, which isn't eye-popping for a closer but a far cry from his April figure. He's even had seven 1-2-3 innings, which helps mute The Fernando Rodney Experience jibes. While the Twins bullpen has its issues, Rodney is not one of them. A month ago, I could not have said that. It's only the first of June. The Twins have more than 100 games to play. But these next two games against Cleveland feel darn close to must-win for Minnesota. Cleveland now has a 6.5 game lead on the third-place Twins. Add a couple more to the margin, and it's hard to see how the Twins can stay in the race with the surging Tribe. Cleveland's not the nearly perfect team it was last year; the bullpen is notably weaker, with Andrew Miller injured, Bryan Shaw gone and a number of guys who had big years in 2017 suddenly ineffective. But other than the starting rotation -- which itself has suddenly sprung a leak -- the Twins aren't nearly as good in any aspect as they were last year either. The Twins were good enough last year, barely, to grab the last wild-card spot. This year, it appears, the best chance of making the playoffs is winning the AL Central. And two months into the season, that chance seems to be rapidly vanishing. In Thursday's post I made an offhand comment about the imminent return of Ervin Santana. A few hours after I typed that, I learned what many others knew Wednesday, that Santana's rehab assignment had been aborted. I have, from time to time, voiced caution about Santana's return. The role of the fingers in pitching is subtle but vital, and if the surgery on his right middle finger winds up imparing flexibility or feeling in the digit, that figures to be a significant problem. I should have been more skeptical Wednesday, especially considering the reports of diminished velocity in Santana's first two outings. In other bad news, Joe Mauer's concussion symptoms apparently aren't getting any better. The chatter from the broadcasters late in the road trip was positive, but the standard broadcaser optimism was misplaced. I think the Twins really miss the consistent quality of Mauer's at-bats and the example he sets. He plans his work and works his plan. We see so many flail-and-fail at-bats; we should appreciate Mauer's quiet professionalism more than we do.